I am pleased to extend a welcome to Everest - the returned prodigal. These magnetic tape/35 mm film analogues date from the late 1950s. They are not complete strangers to the CD medium but this initiative via Countdown Media GmbH seems to be the most systematic reissue programme they have enjoyed. The original stereo tapes were made by audio perfectionist Harry Belock. Here they are liberated from the vinyl vagaries of surface noise. The results evidently benefit by going as close as possible to the source - drawn down from the original 35mm magnetic film masters rather than from 1960s vinyl. The discs are CD-Rs; not that this should put you off in any way. The results deliver pellucidly strong sound. The recordings derive from sessions block-booked in London's Walthamstow Assembly Hall in 1958. The only exception is the Houston-based Scriabin/Amirov disc. Countdown Media's programme is posited on producing facsimiles of the original LPs so be ready for very much shorter than usual playing times. On the other hand the prices are set at upper bargain level to partly counter the brevity. It’s a shame though that these issues do not quote total playing times on the rear case insert. In this the manufacturer is not alone - regrettable all the same. The design of the discs, inlay and liner booklet is very adroitly done. The discs look especially handsome. My only quibble is that the entire front of the booklet should have been filled with the whole of the original LP front-sleeve rather than allowing a surrounding frame; it weakens the visual impact. Those LP covers are worth recalling even if some of them were either a bit cheesy (Kodály/Bartók) or outright odd (Vaughan Williams). Presentation is - with the exceptions mentioned above - all you might have hoped for. Design and font choices are faithful to the distinctive Everest LP sleeve look. The liner notes are from the originals and are in English only. I should note that Brian Wilson and Dan Morgan have already assayed several of these Everest programmes under November’s Download Roundups (2013/15 and 2013/16). I have been allocated seven discs which form the focus of this feature. To my surprise the Scriabin comes across as less of a magniloquent orchestral extravaganza than I had expected. Instead the recording and Stokowski's approach capture the delicately swooning chamber textures. The lavish moments are sparingly put across. The exotic element is strong and one can see from where Griffes' Kubla Khan might have derived its inspiration. The Houston orchestra is in spanking form and the close-up Phase-4 style miking hides nothing. Stokowski made a small stack of recordings with the Houston orchestra; one of his exultant refuges after Philadelphia and he parted company. He also made recordings with this orchestra for Capitol - notably the savagely cut Gliere Ilya Murometz - reissued a couple of years back by EMI. The Amirov Azerbaijan Mugam is a quarter-hour far-Eastern fantasy but this time by a composer who was actually born in that then-Soviet Republic. It's an exuberantly flourishing piece which takes a Rimskian accent and then suffuses it with yet more oriental flavour and opulence including an orchestral piano. Think in terms of Borodin and Enescu - the latter in his most nationalistic and vividly coloured vein. If you want more Amirov you should not hesitate to seek out two deleted Olympias (OCD490 and OCD578) and a brace of Naxos CDs (8.572666 and 8.572170). 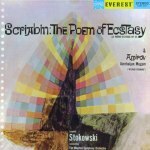 Stokowski is a natural in this territory but even so it must have been quite courageous to go where he took Everest on this occasion; not to mention the composer's Soviet allegiances reflected in the titles of his works. Whatever happened to the tone poems To the Memory of the Heroes of the Greek National War and The Pledge of the Korean Guerilla Fighter? The six movements of the Mugam - or rhapsody - are not separately tracked. The lucid booklet notes are by Paul Affelder. The Everest team came to London’s Walthamstow Assembly Hall in 1958 for the recordings featured on the other albums. The company's nerve seems to have failed in only one respect for these Ferencsik sessions. Unusually the Psalmus Hungaricus is sung in an English translation by E J Dent. Despite the English words ringing authentically the link with the music to which they are sung is often broken, awkward or at least strained. Still, tenor Raymond Nilsson is a dedicated soloist and the London Philharmonic Choir are extremely well coached - listen to their precise yet wild wailing at 6:30 onwards where they rise from quietude to fervour. Also striking are the groaning basses heard right at the end of the piece. They call up memories of Rachmaninov's Russian basses in his Vespers - best experienced in the 1960s Melodiya recording directed by Alexander Sveshnikov. Ferencsik proves a responsive director. This blazingly patriotic piece is well worth getting to know if your Kodály is restricted to Hary Janos and the Peacock Variations. It joins the nationalistic choral works of Sibelius, Alfvén and Nielsen. The balance is more natural than the luxuriously indulgent Houston sessions. The English version makes this something of a museum novelty yet well worth exploring. Kodály novitiates should also seek out his late Symphony which is unnervingly similar at times to the Moeran Symphony of 1937. The Bartók Dance Suite is in six separately tracked movements, unlike the five sections of the Amirov which are allocated just one. This is Bartók at the nationalistic accessible end of his range - the closest he came to fellow Hungarian Kodály. 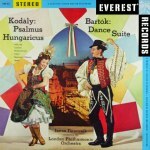 Ferencsik and Everest have forcefully reminded me of what I should never have forgotten: Bartók's fantastic imaginative skill in weaving originality from folk sources. Stokowski and Goossens shared a gift for the vivacious and exotic. The three Goossens discs here showcase this aspect. This is a rare opportunity to hear leader Hugh Maguire taking on the persona of the beguiling Sultana. His violin is most pleasingly balanced in the overall audio canvas as also are star spots for the LSO's clarinet and flute principals - does anyone have their names, please? We are talking 1958. This work has been astonishingly prolific on record; less often heard in concert. Here Goossens can at times come across as glutinous when more testosterone is called for. Things could have gone with more zing in The Sea and Sindbad's Ship - compare this with the superb Soviets: Golovanov (Boheme) and 1960s vintage Svetlanov (KlassicHaus) or indeed with Beecham's and Stokowski's efforts respectively for EMI and RCA and later for Phase 4. The music-making does kindle in the final movement with some truly splendid and imaginative sculpturing and playing. A very good rather than a great reading. Goossens had left Australia under a lurid cloud but this was no obstacle to his championing of John Antill's aborigine legend-based ballet Corroboree - here heard in brief suite form. The music is mildly 'modernistic'; nothing too outlandish but sufficiently strange to make it otherworldly. Percussion is creatively exploited, coupled with abrasive brass and inventive rhythmic activity. The orchestration is spick and span, bright and clear - never congested. Some of the brass writing recalls the gritty, rasping and growling way Malcolm Arnold has with trumpets and trombones. In the violent initial Welcome Ceremony there is the occasional reminiscence of The Rite of Spring but also some jaunty humour. One wonders what else Antill has written. 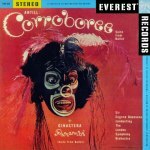 Corroboree has kept his name alive for so long. There is an opera The Music Critic as well as much film music, Five Australian Songs and several orchestral works. It would be good to be able to hear more Antill beyond Corroboree. What are the chances? Ginastera's Panambi is another jungle ballet with surely inevitable echoes of the Matto Grosso works of Villa-Lobos. The textures here are more refulgent than those of Antill. Moonlight on the Parana is the most lush of the four movements. The language is an extension of that used by Ravel but alive with danger and bird-song. Ginastera is somewhat closer to Antill, to Revueltas and to Stravinsky's Rite in the percussion-dominated Invocation of the Powerful Spirits. Even the title shares atmosphere with the Rite. A softer and lyrical impulse runs at a leisurely pace through Lament of the Maidens. The last of the four movements is Dance of the Warriors. Its restless and feral progress recalls not only The Rite but also a much earlier work, another ballet this time by Percy Grainger, The Warriors. Panambi is raucously ozone-rich - even more so than the intriguing Antill piece. This is the only disc to overlap content with another Everest. Panambi, a suite in four movements is also to be found alongside Villa-Lobos and the Ginastera Estancia suite on SDBR 3041. 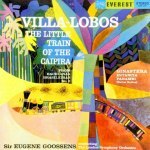 The Little Train of the Caipira is one movement from the second of Villa-Lobos's nine Bachianas Brasileiras. It's a sort of Brazilian equivalent of Honegger's Pacific 231. Here the train travels with a sway and a toothy smile along rails threatening to be engulfed by jungle greenery. Villa-Lobos gets big capitals billing on the cover despite his one piece running to just 4½ tangy minutes. Poor Ginastera, whose music makes up more than 80% of the disc's playing time, has his name doomed to characters smaller than the title of the Villa-Lobos work. I have already commented on the Panambi suite so we can spend a little time with the four Estancia (Ranch) movements. Ginastera's ballet is a sort of echo of Copland's Wild West dance pieces. The writing casts aside the jungle danger and indulgence of Panambi in favour of a tense Latino-romantic atmosphere. As with all this music it is most expertly recorded. 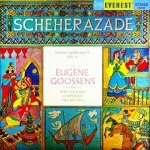 That up-close and unflinching impact is common to the Stokowski and Goossens discs - the only exception being the more naturalistic concert hall spread adopted for Scheherazade. Now for two discs each carrying a single substantial symphony. This meaty four-movement symphony was begun during the Second World War and was finished a year after the conflict had run its course. Its atmosphere is one of conflict and heroism. The writing on occasion treads a slippery way between desolation and consolation. It’s a very much bigger brother to Copland's other works that have the word "symphony" in their titles. In that sense it can be heard more as a brother to other symphonies of or associated with that era: Harris 5, Schuman 3, Stanley Bate 3, Benjamin and Clifford. As Paul Affelder's notes remind us, this work brings to an end a stylistic period when Copland-Americana reigned supreme. It represents the highest tidal reach of his Western outdoors period. After it there were few places he could go without kicking over the same stylistic traces. This would become apparent with his statuesque and declamatory twelve tone works of the 1950s and beyond. The cheesy Wild Westernisms and wince-making hoe-downs and barn-dances of Billy and Rodeo are absent. Instead Copland capitalises on his considerable gifts for nobility (Lincoln Portrait and the famous Fanfare), affectingly poignant ideas (Appalachian Spring and the little known opera The Tender Land) and zestful, rhythmic foot-tapping vitality (Outdoor Overture and El Salón México). That latter element can also be heard in the Second Symphony of another American, Randall Thompson - recently (December 2013) sensationally revived in Cardiff by Carlos Kalmar and the BBC National Orchestra of Wales. The Copland Symphony is most transparently recorded with a zoomed-in effect comparable to that experienced with the Stokowski disc. It's an exciting sound that matches rib-cage impact with close-up delicacy. Not the most natural of balances but it certainly makes an ideal complement to following the music with a full score - so much detail is captured and closely held up to scrutiny. The searing third movement surely shows that Copland had heard the Shostakovich symphonies of the 1930s and the war years. The Third Symphony's finale weaves in Fanfare for the Common Man as the finale - the longest of the four movements. It has all the gravitas and defiance you could wish. 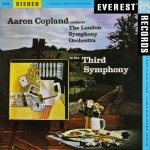 Copland was to record this once more commercially for CBS and with improved technology. However this Everest recording remains something very special. This may well be the best known transcription issued by Everest. For whatever reason, the American company beat Decca to the draw in recording RVW’s last symphony though it was Decca who had recorded all eight of the previous symphonies. A decade or so ago Universal issued those first recordings of the 1950s in a boxed set and added this Ninth after negotiations with the Everest rights-owner at the time (review). Those other eight were the medium through which many of us came to know the symphonies when in the 1970s they were issued in "processed" stereo on Decca Eclipse LPs. This last symphony was written between early 1956 and late 1957. The composer wrote it largely in London but some work was done to it in Majorca and at Gerald Finzi's Ashmansworth home. Although the premiere was given by the Royal PO conducted by Sir Malcolm Sargent it was widely championed by Sir Adrian Boult. It is brooding and sometimes sinister and most naturally belongs in the company of the Third, Fourth and Sixth symphonies. The LP travelled widely and is likely to have made RVW's name in the USA, effectively blazing a trail. Recordings of the symphonies were made by CBS and others with Mitropoulos, Stokowski and Bernstein but in the studio they did not touch the Ninth. Boult and EMI were to record the nine symphonies in the late 1960s into the 1970s. However, it was a young American, André Previn, with an American company, RCA who were to return the compliment Everest and Boult had paid in 1958 at sessions begun not long after the composer's death. The recording has a slightly raw treble-heavy edge but its clarity sings out unblurred. 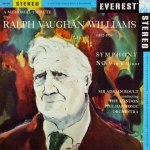 For a complete listing of these Everest recordings go to www.evereststereo.com. I hope to write a follow-up feature about other Everest CDs next year. “I was most interested in your article about some Everest releases. Back in the days of the Australian World Record Club in the early 60s, just about the entire Everest catalogue was available in the form of dividends: for every three LPs you ordered, you could get a dividend for half-price. Thus I bought, for example, Boult's very closely-miked Job (still my favourite version), his VW9, and especially Arnold's 3rd symphony, my first encounter with a composer whose music I've obsessively explored since. Our WRC also offered on its own label lots of EMI, Decca and Columbia, a number of European labels, and most importantly for me, many of the Lyrita catalogue. Their records were about half the going rate for a full-priced LP. I picked up some Everests a few years ago from Berkshire Record Outlet at giveaway prices. I didn't really need such things as Boult's Hindemith Symphony in E Flat and his Shostakovich 6th, but it was those versions from which I'd learned those works, and despite the playing times, they were worth having. I've long thought it a shame that Boult is now known mainly as a specialist in English music when he clearly had sympathies far wider than that. I still remember his occasional letters to Gramophone, signed simply Adrian C Boult - no flaunting of the knighthood for him! “Although I like Copland's Everest version of his third symphony (Philips also released it in the early 90s), I love the intensity of the old Dorati/Minneapolis version on Mercury. Haydn House did a less than successful release of it a few years back, and I'm hopeful that Andrew Rose at Pristine Audio will try a refurbishment. “There's not a great deal more Antill to explore, orchestrally at least (see here) His Outdoor Overture is on the Naxos version of Corroboree. His Overture for a Momentous Occasion, which I think might have been written for a student orchestra, has been recorded by the Australian Broadcasting Corporation and I've heard it a few times on the radio. It's rather fun and much what its title would suggest. As far as I know, the recording has never been released commercially.